I had such a fun night on Sunday — the lovely miss Gena invited me and some fellow DC foodies over for a vegan potluck feast! 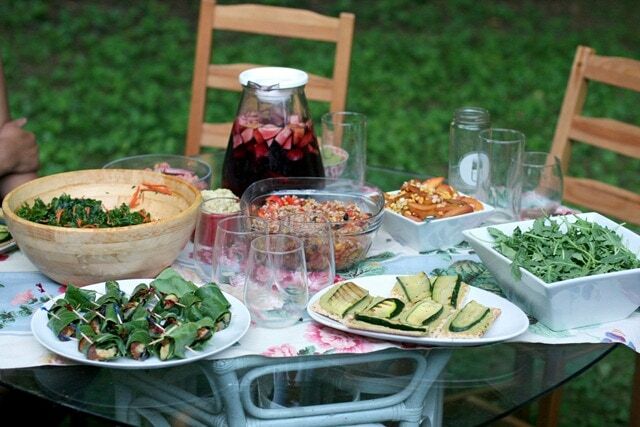 Given that everyone in attendance shared a love of food, we had quite the delicious spread. Everything was vegan, too! 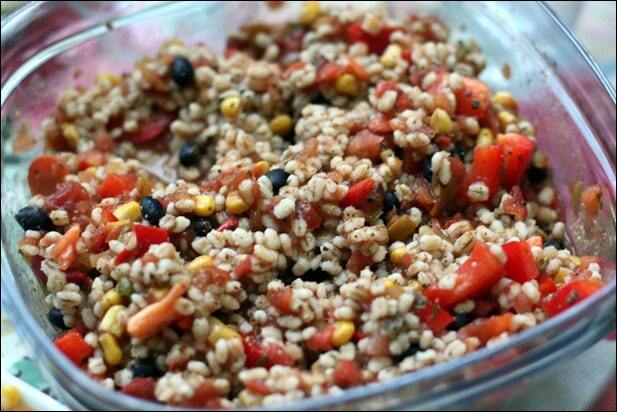 My contribution was this super simple Mexican Barley Salad. 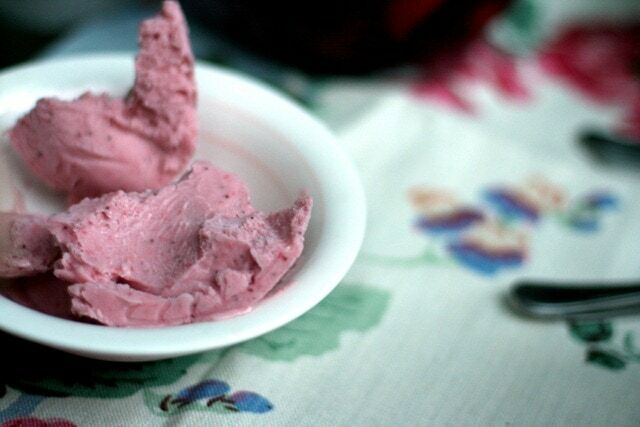 It’s literally the easiest thing ever to make — here’s the “recipe,” if you can call it that! You guys know me and my love for simple dishes. 2. Once barley is cooked, mix in a jar of salsa and a can of drained/rinsed black beans. 3. 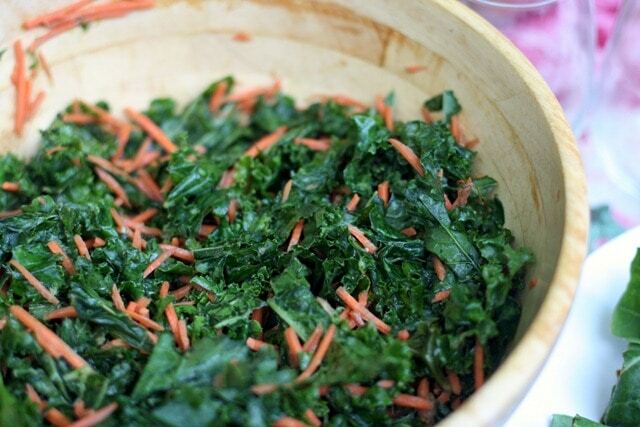 Add any extra veggies you want — I added some chopped red pepper. The corn and everything else you see was already in the salsa. Everyone seemed to like it and I enjoyed some leftovers for lunch today at my internship, too. Still tasty! Yum!! It was all delicious but I especially loved the “sushi” — I ate at least 5 of those things! You can find both of the latter recipes in her blog post today. 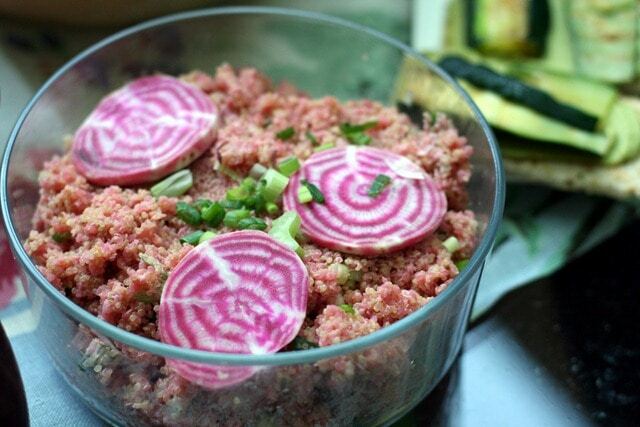 Valerie brought this quinoa salad topped with a couple sliced candy striped raw beets. Aren’t they beautiful? 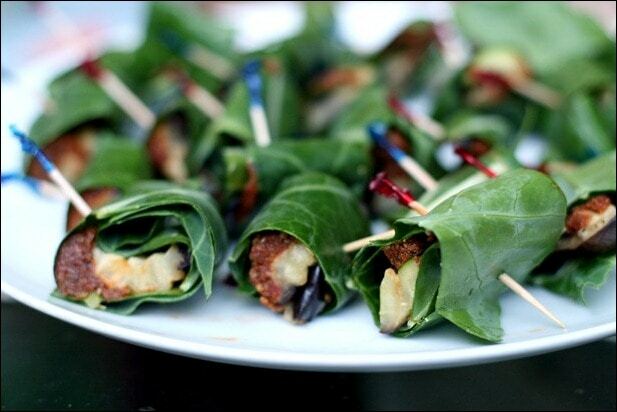 She also brought scallion cashew “cheese” to top it with — delicious! It had a goat cheese like consistency. 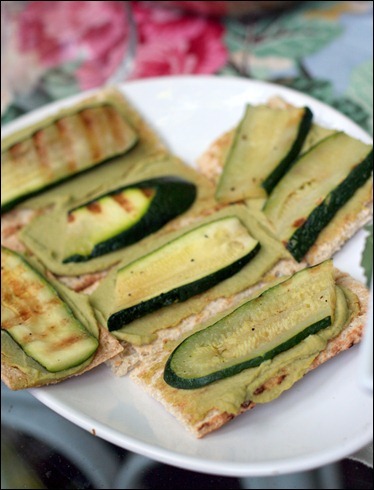 You can find both of these recipes on her blog! Dasha, a new friend who works for my beloved Sweetgreen, brought these awesome roasted nectarines with balsamic vinegar, corn, and basil. Thinly slice nectarines. Place into pan (ungreased) over medium-high heat; cook until beginning to soften. Add 1 TBSP vinegar and continue to caramelize. Remove from heat and allow to cool. Put corn into pan, salt, and cook until softened and beginning to brown. Add 1/2 to 1 TBSP vinegar, stir. 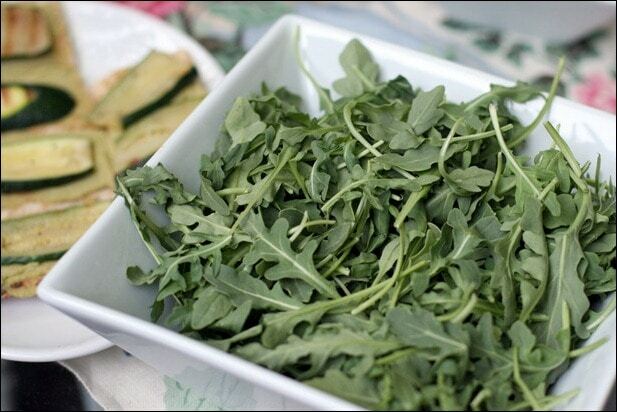 Add basil and allow to cook 1-2 more minutes. Remove from heat and allow to cool slightly. 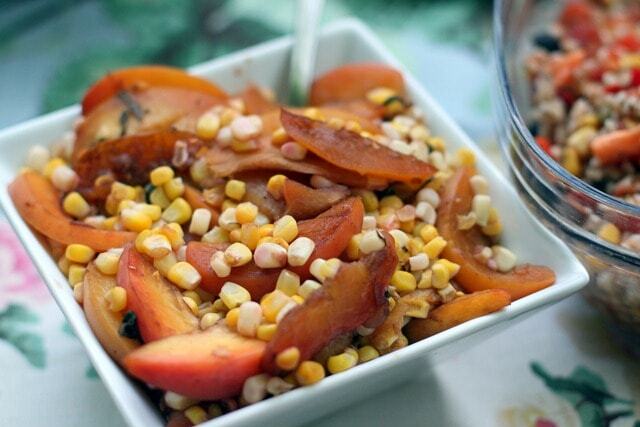 Toss nectarines and corn with arugula; add toasted almonds if desired. The flavors get much better as the days pass; for non-vegans, this recipe is also wonderful with seared scallops. And here’s my plate! I tried a little of everything, of course, and went back for a good amount of seconds, too. Everything was so good and fresh! 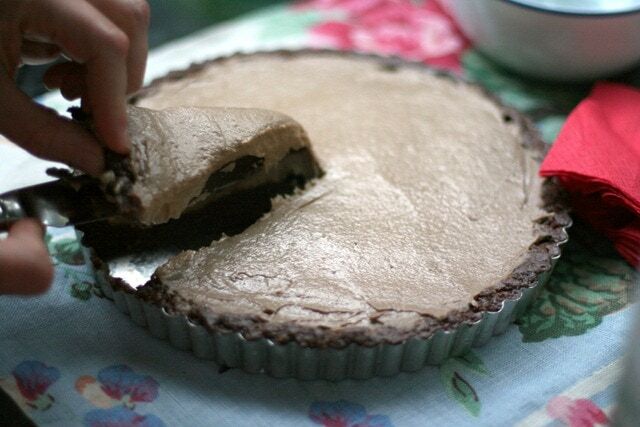 Victoria made this gluten free and vegan peanut butter pie — the crust was made from dates, nuts, and I think cacao powder? 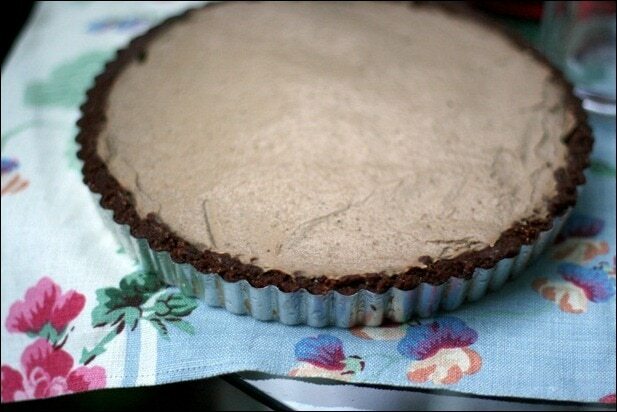 The filling was made from pureed frozen bananas and peanut flour. Genius! To go with our pie, why of course — ice cream! 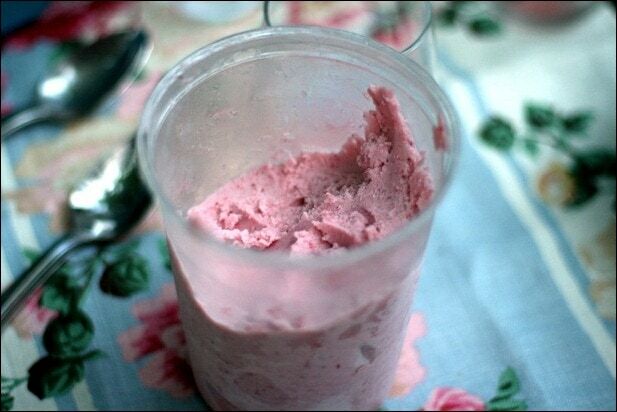 This was also vegan — a roasted strawberry and coconut milk ice cream made by Andrea! Soooo good. Again, roasted fruit = awesome. You can find the recipe for the ice cream on Andrea’s blog. What a fun night — thanks again, Gena, for the warm welcome back. 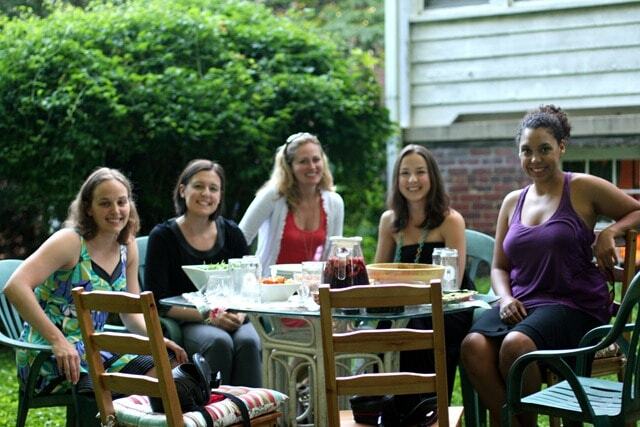 And thanks to everyone for the delicious food and great company! Previous article: First Time Paddle Boarding! Dining with fellow foodies is always a blast! Love how fresh & delicious your spread looks! Thanks so much for joining, and for being back. I’m so happy you’re here. 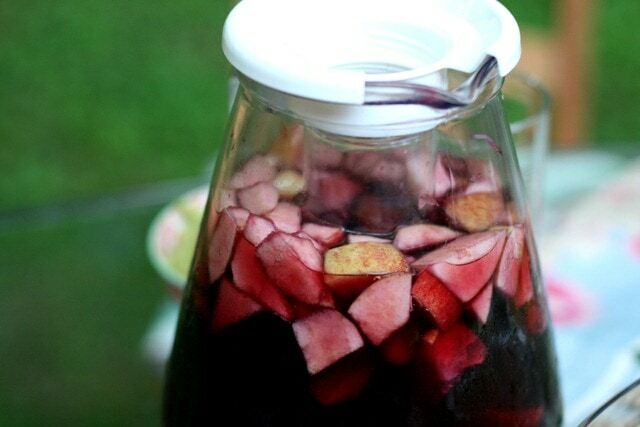 Also, I have to steal your sangria photo for when I post later tonight!! I totally forgot to take one of the beverage–I was too fixated on catching the food! Please, feel free! 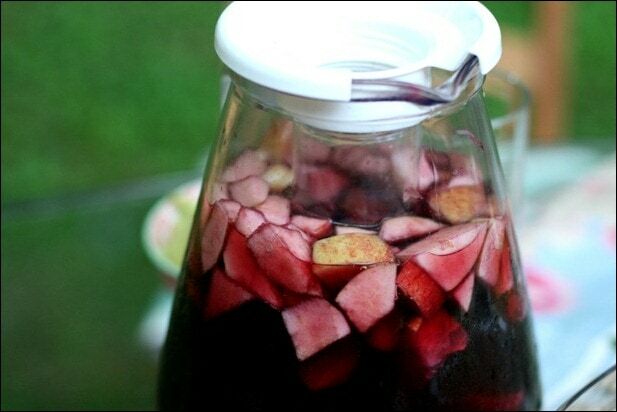 :) I feel like the sangria picture just SCREAMS summer! Wow, what a fantastic potluck! Everything looks incredible! What a spread! I can’t wait to try all of the recipes. I LOVE this! So fun – I am starting to focus more on eating vegan as I found during a 21 day reset that it made me feel SO much better. Thanks for the recipes! This looks like the tastiest BBQ ever! I went to one a few weeks ago, and ended up eating the only vegetarian option they had: hot dog buns filled with relish. Oy. anne, i do not cook AT ALL, yet i would like to ease into doing some homemade dishes this summer – your “recipe” is perfect! it IS super easy!! so glad you had fun time with everyone! So much fun! And I hope you are now convinced that you need peanut flour in your life. 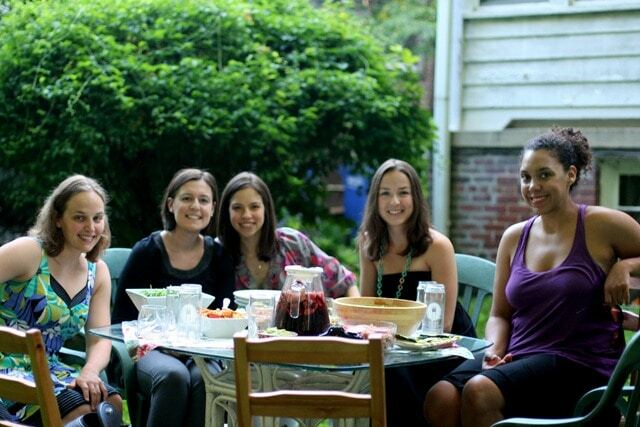 Warm nights and mornings, fireflies, and sangria for sure mean summer to me! 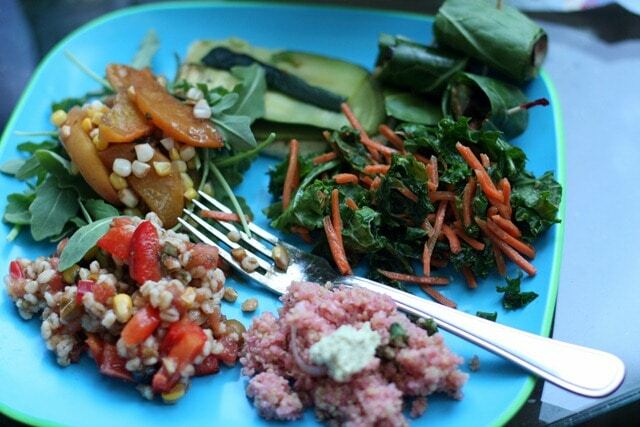 The salads look delish. Expecially the barley and kale. Gosh, that menu looks fantastic!! What a great spread. Wow – everything looks and sounds so amazing, and your photos always make it all look so appealing! :) Can’t wait to try the fruit recipe! Good point – I never thought about it that way! Will certainly give it a try now. I tried grilled pineapple and peaches last summer and have been craving it a lot lately, so good! Yep! 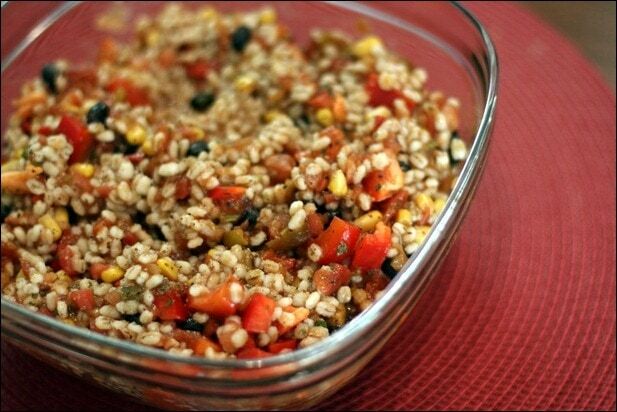 I was actually planning to use quinoa because I knew one of the girls attending is gluten free, but when I went to make it I realized I didn’t have any in the pantry! Oh well. Brown rice would work, too! Is there a recipe floating around for that pie?! Must. make. That recipe looks amazing. I could use some easy and healthy recipes this week and I think I have everything in the house. Okay, so you don’t know me and I live in San Diego, I’m nonetheless crushed that I wasn’t invited. (JK) It all looks so good. Thanks for all the great recipes!